One of my favorite commercials at the moment is from Skittles showcasing their new sour candy Fizzl’d Fruits. Seriously – who doesn’t laugh when Tube Sock Man starts running in place?? Though Skittles are clearly not paleo, this reminded me of how I wanted a tart and refreshing taste. 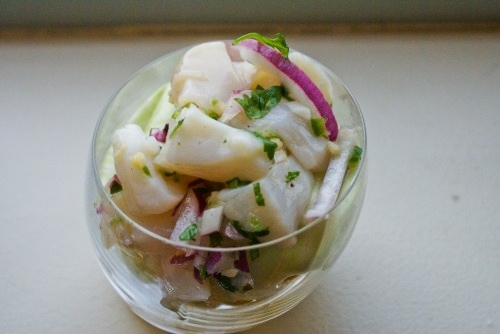 There’s nothing better to provide that than fresh citrus in ceviche! In a large mixing bowl, combine all of your ingredients together (except the scallops and the avocado) and mix thoroughly. You’ll love the intoxicating smell – it’s so fresh and so clean! Set the bowl aside. Take your scallops and quarter them. (You can cut them in any size you want really.) Once you have finished quartering all of your scallops, mix in a bowl with your citrus marinade. The marinade should cover all of the scallops so make sure there are enough juices in your bowl. Then cover and refrigerate for 3-4 hours while they marinate. 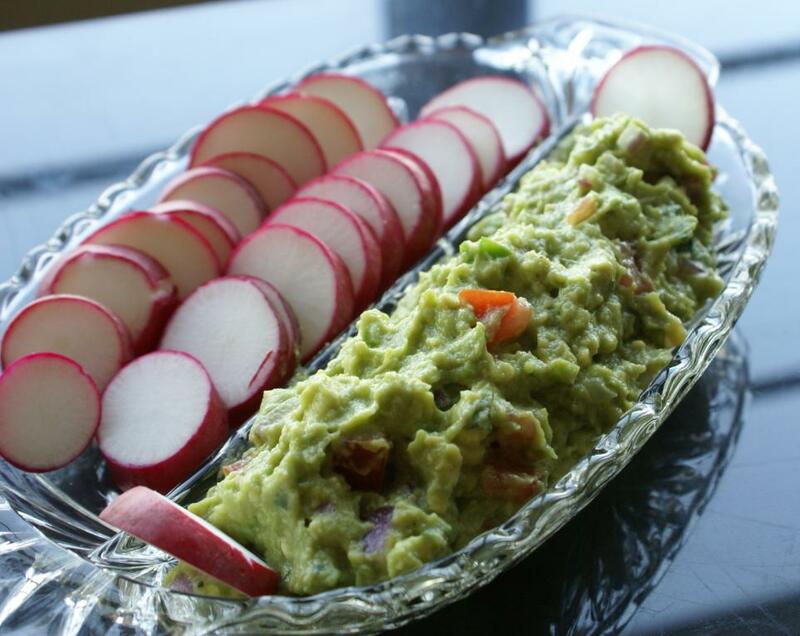 Right before serving, add in the avocado and serve while the ceviche is still cold. After eating this – you’ll definitely want to say Hit Me Again Tube Sock!! I miss potato chips. 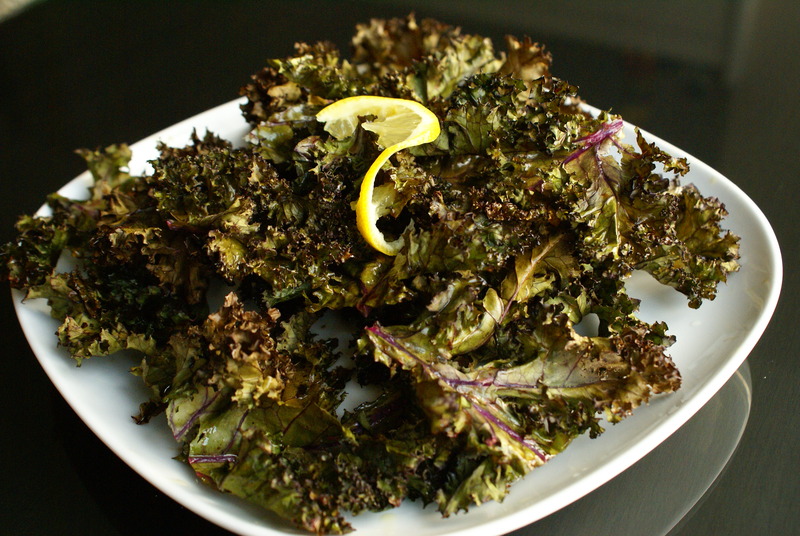 These lemon kale chips are a crunchy and healthy snack that give me the texture I want. This is an easy and delicious recipe while providing you with fiber and lots of vitamins (kale has loads of Vitamin A & C!). When I received red kale from my weekly CSA I couldn’t wait to make them! Wash your kale and pat dry with paper towels. Then cut them up to roughly 2 inches each (that’s the size I did but you can do smaller or larger depending on what you want). Roll your lemon on the kitchen counter to make it easy to extract the juices. Cut your lemon into wedges and spray the kale leaves with the juice. Pour on the olive oil and sprinkle the sea salt. Then just mix the kale chips thoroughly so that the lemon juice and olive oil are evenly spread. Spread the kale on an foil paper lined tray and set in the oven for 10 minutes. Remove from oven and let cool. I like to squeeze a little bit more lemon juice on after it’s cooled because I love the citrus taste. Serve and enjoy! In a rush? Me too. Keep it simple with tasty and filling snacks like this one – chopped egg and onions. For those of you missing the crunch of crackers – try endives. It’s a great vehicle for any spreads, dips or snacks like these and a much healthier alternative. 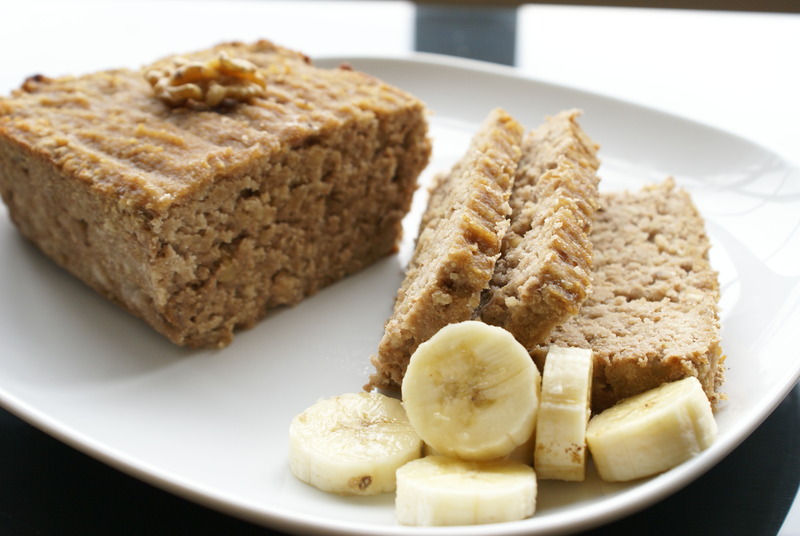 Paleo and Banana Nut Bread – together as one? I know what you’re saying. Surely you can’t be serious. I am serious and don’t call me Shirley. BOOM! In a small bowl, mash 2 ripe bananas with a fork and set aside. Mix together almond flour, coconut flour and chopped walnuts. Add apple butter, water, eggs and bananas and mix thoroughly. (Apple butter is great – no sugar added – just natural apples! I love it as a great natural sweetener.) Pour the batter into a 1.5 quart loaf dish. Place in oven for one hour. Remove from oven and let cool. Serve warm or at room temperature. Enjoy! World Cup 2010 starts TODAY!! For those of you as excited as me, you won’t have much time for cooking. You’ll want to focus on the games and World Cup Fun Facts. Did you know the last time the U.S. met England in the World Cup was sixty years ago in 1950? The game came to be regarded as one of the greatest upsets in the history of World Cup soccer- the so-called Miracle on Grass. Did you also know that the U.S. goalie, Tim Howard, who is really cute and incredibly talented – was diagnosed with Tourette’s Syndrome at the age of 9!? Talk about rising above adversity – we have no excuse not to do grueling workouts like this. This recipe is easy breezy and will cook up in minutes. 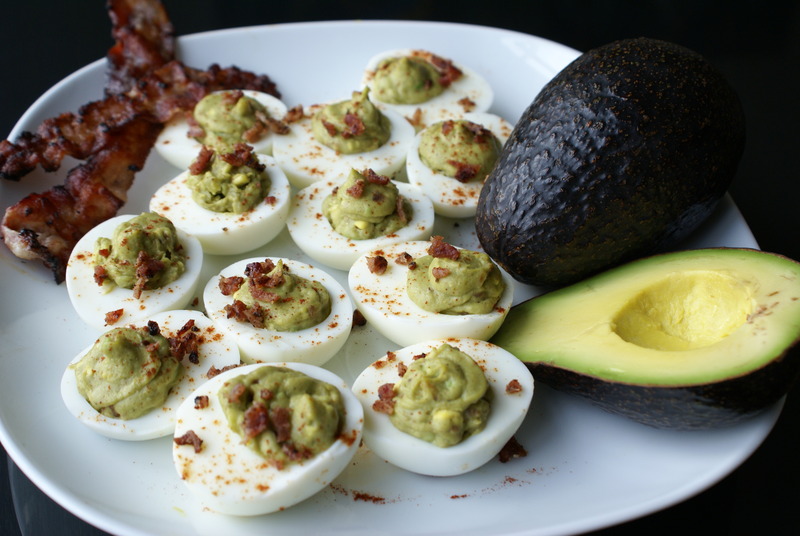 It’s the perfect paleo snack and can even satisfy non-paleo diners at your World Cup brunch party. Enjoy the games! 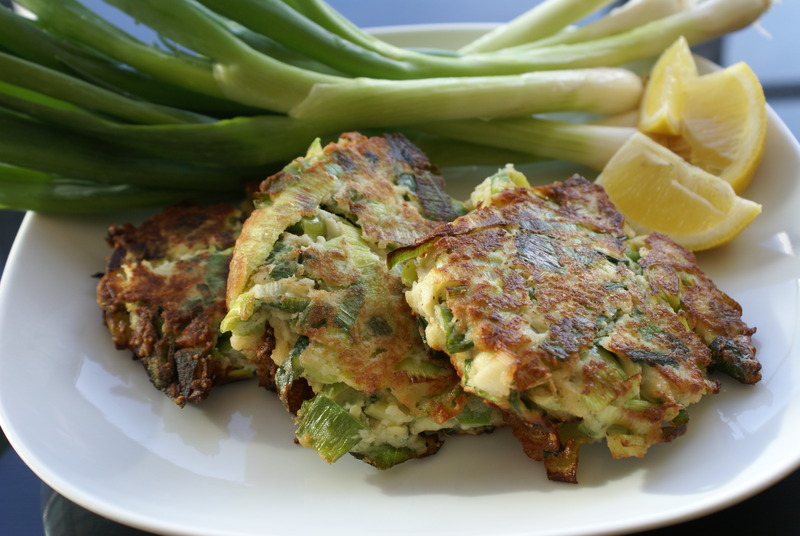 Chop the leeks coarsely – I cut mine in 1/4 inch pieces. Place in a medium size bowl and rinse under cold water. I find that there’s a lot of hidden dirt in the leeks after I cut them so a quick rinse is necessary unless you like eating mud. Place the washed leeks in a pot of boiling water and cook for 5 minutes until tender. Drain and set aside. Once the leeks have cooled a bit, hand mix the leeks with almond flour, eggs, garlic, salt and pepper. Form small patties and arrange on a tray to fry. In a large skillet, heat olive oil and pan fry until golden (usually 2-3 minutes on each side). Serve hot or at room temperature. Raw cocoa is an amazing superfood with some of the highest antioxidants of all the natural foods in the world. Does that mean you can go out eating all of the chocolate you want? Negative ghost rider – the pattern is full. Commercial chocolate has several additives including sugar, soy lecithin, corn syrup, and more sugar. Unfortunately, things that are definitely not paleo. If you’ve ever tried eating an unsweetened cacao bar, you can see why chocolatiers do not use cacao in it’s rarest form – it’s as bitter as a housewife from Orange County. After experimenting with some recipes, I found that infusing cacao with some natural sweeteners, compliments of Mother Nature, you can get a great chocolate taste that is paleo friendly. In this recipe, I infused the cacao with cherry juice and a pitted date to create a sweet and delicious chocolate dipped cherry. They’re not exactly the bon bons that Peggy Bundy would be popping while watching Oprah, but this is the closest thing to a paleo cherry cordial as you might get. It’s one of my favorite snacks to kick that sweet tooth. Now You Got Your Cherry Bomb! Using a cherry pitter, take out all of the pits of your cherries. In a blender, add the pitted date and 1 cup of pitted cherries and blend until you have a liquid juice. Set aside. Place the cacao bar in a small saucepan on medium heat and stir constantly until the chocolate is fully melted. (The chocolate will melt faster if broken up into smaller pieces.) Once the chocolate is smooth, pour in the cherry juice mixture and stir on low heat. 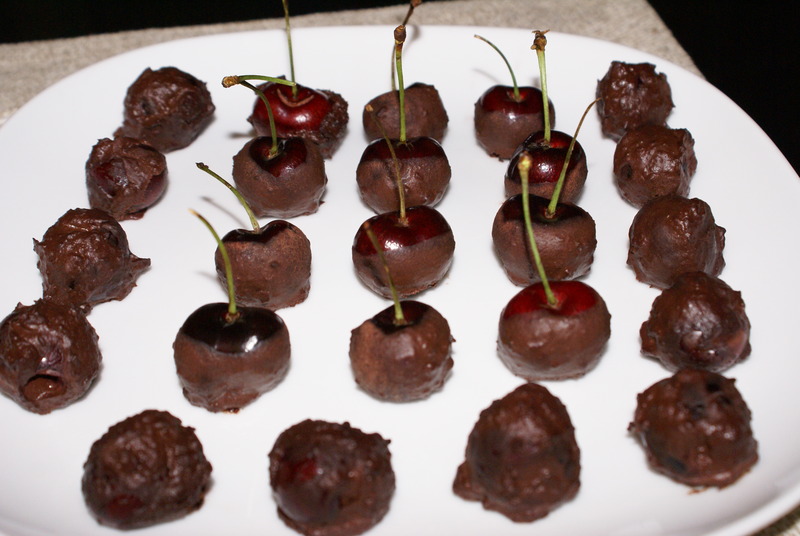 Take your pitted cherries and dip them in the chocolate mixture, fully coating each cherry. (I like to eat cherries without worrying about the stems and seeds. 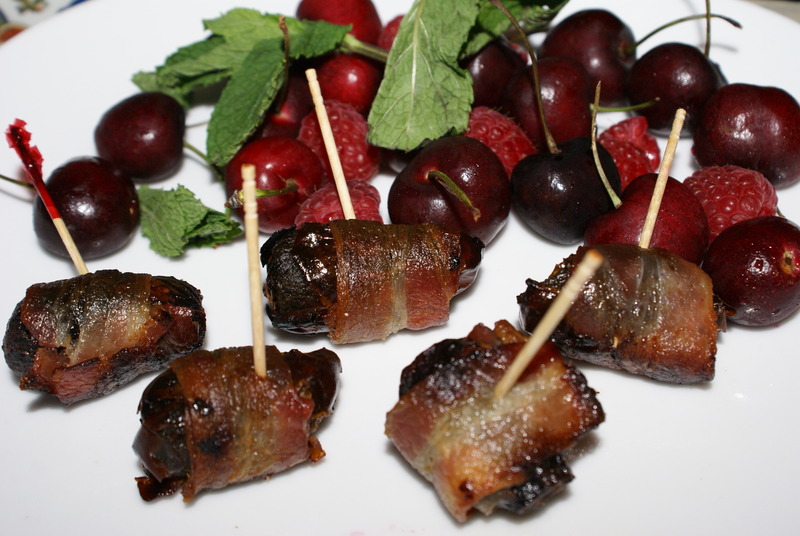 But for ease of dipping, feel free to use cherries with the pits and stems attached.) Place on a parchment paper lined tray and put in the refrigerator for 15 minutes. Serve and enjoy! Remember Rocky IV? It is one of my favorite movies of all time with the best music montage ever… Hearts on Fire. I always get chills watching Rocky and Drago’s training montage with the juxtaposition of East vs. West, Natural vs. Man-Made, Talia Shire vs. Brigitte Nielsen (I might have made up the last part). These appetizers give me the same amount of joy as a good music montage. The combination of salty bacon, sweet dates and a crunchy marcona almond is like a symphony in my mouth. Who needs candy when you have a natural paleo version right here? We’ll leave the artificial sweeteners for Drago. Stuff each date with one marcona almond. Cut each strip of bacon in half. Wrap each date with a piece of the cut bacon and place the seam side of the bacon wrap face down on an oven-safe tray lined with parchment paper or aluminum foil. Repeat for all of the bacon and dates. Place in oven and bake for 10 minutes or until bacon is browned crispy throughout. Take out to cool and serve warm or at room temperature. Happy Friday! I thought I’d start my first post at the end of the week. Why not?! 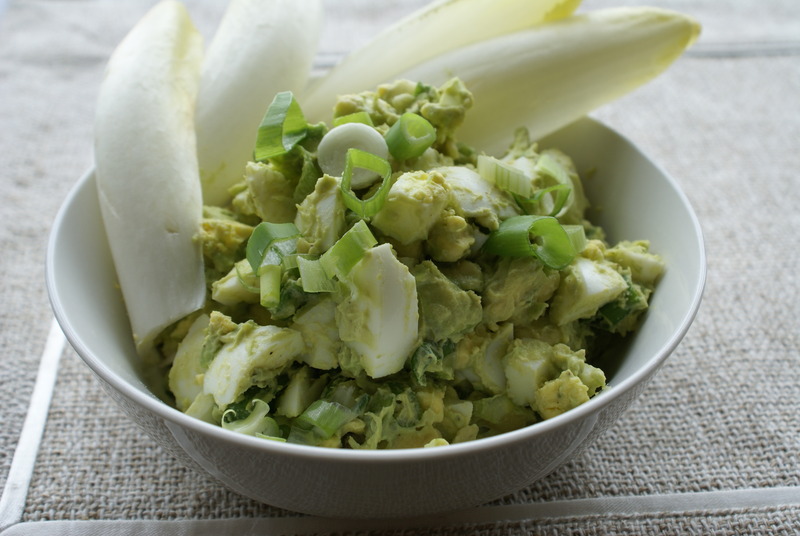 In advance of Memorial Day weekend, here is a tasty appetizer dish to try out for any paleo party you might be throwing. Heat your skillet with vegetable oil on high heat. While that is heating up, take out the hearts of palm and dry on a paper towel to let it drain thoroughly. Cut the hearts of palm into pieces about one inch thick and transfer to a mixing bowl. Add in the chives, garlic, and whisked eggs as well as salt and pepper with the hearts of palm. Gently blend together so that each piece has a nice coating on it. In a separate bowl, stir together almond flour and coconut flour with some salt and pepper. I wanted to get more of a coconut taste so I used more coconut flour in the batch. Once the flours are mixed, stir the flour mixture into the hearts of palm mixture until just combined. Make sure to be gentle with the heart of palm as the centers have a tendency to loosen and fall out. Once each piece is coated with the flour mixture, place each piece in the hot pan. It should fry very quickly (2-3 minutes per side). 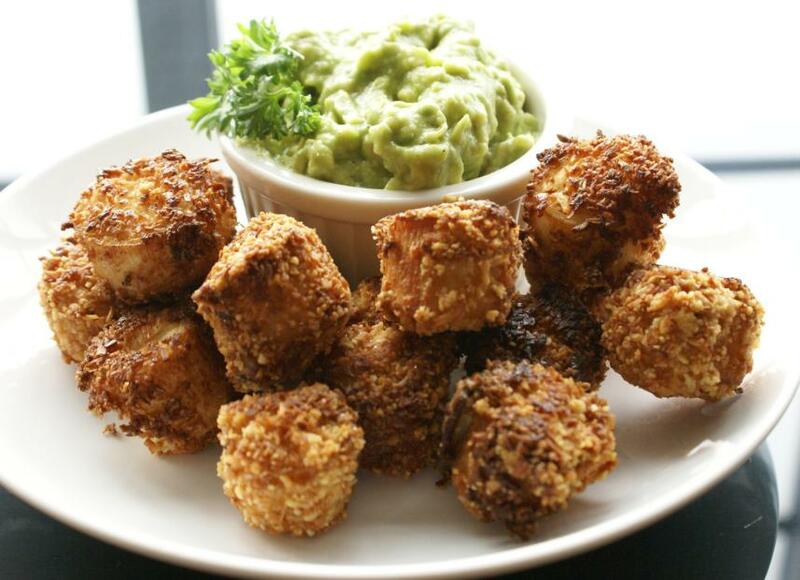 Once golden brown, remove the fritters and place on a paper towel-lined tray to drain. Serve immediately. 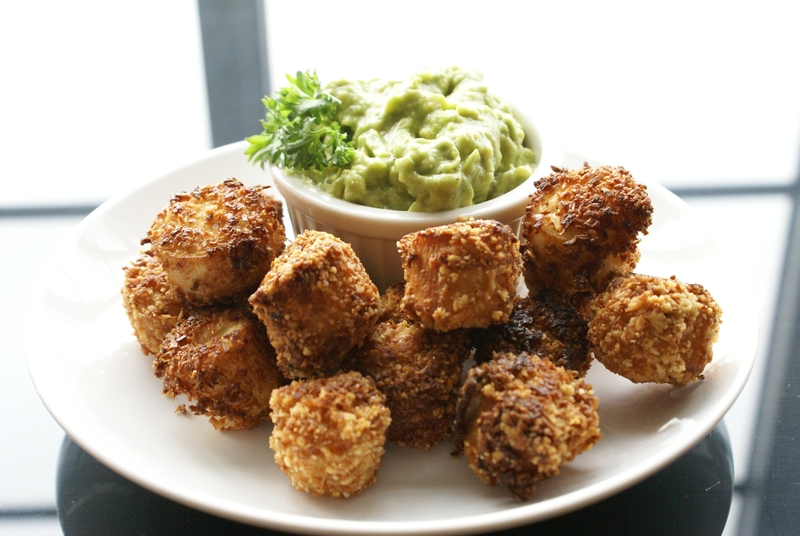 I made a simple avocado dipping sauce but you can enjoy these guys plain as well.